Christmas… Decorating? Can we call it that?! Decorating for Christmas was fun, once upon a time. Now, I’m tired, lacking space, and have a serious case of not feeling like it. The kids took over, and while I drew the line at a real tree from the pasture with no space to put it, they dug out the little set of fake trees from the shed and had fun. I even managed to get all the gifts wrapped this week. That’s a new record for early for me. 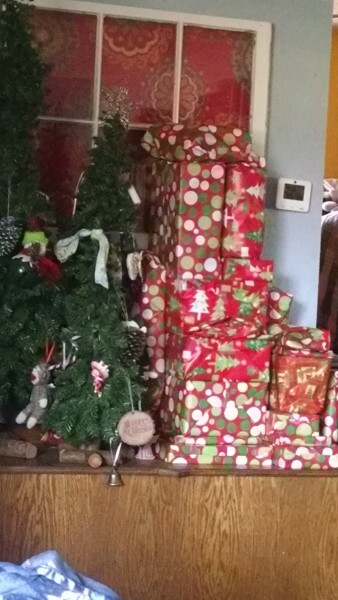 Many children, even with only a few gifts each, still makes for a lot of gifts to wrap. 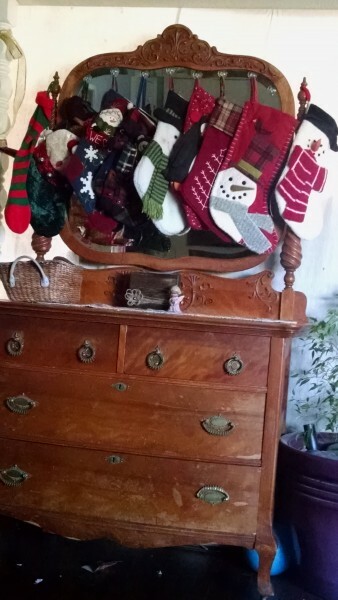 The mantle, formerly serving to hold stockings, is now in the boys’ room, and we had to get creative. My diaper dresser/baby’s dresser in the living room volunteered. While Blaine seemed less than impressed, it works. And Christmas is in a week… I can live with clutter for a week. It’s not going to win any prizes. But, this year, it’s good enough. I’m feeling like a regular Scrooge, unable to get too excited about anything. It’s pathetic and sad and thoroughly annoying me, but… soon. 5 weeks and counting. I believe you have a right to feel this way. HA!! This too shall soon pass. Hey, you know, some years are like that. As long as the kids have fun and you can live with it, it’s fine. This is memories for them (and you). Have a wonderful Christmas!